Beater car. Hooptie car. Decrepit car. Jalopy car. Whatever you might call it, I see them as: money savers, style breakers. Driving a beater has been one of the best financial decisions I’ve made. Plus, does it really matter what it looks like when you are trying to reach financial goals? I say no! In fact, driving a beater can have a lot of benefits when it comes to saving money on a car. Whether it’s your first car, or you need a beater as a second car, or just need a beater for the winter, this definitive beater car guide is going to cover everything from the pros and cons, some of the best beater cars, and some other things to consider (including an important piece of advice at the end with my #1 tip when it comes to beaters). Let’s start with what a beater car exactly means. What is a Beater Car? It’s important to know what is considered a beater car (and, what it’s not). Beater car definition: An older, usually high mileage, car that’s purpose is to get you from point A to point B, usually has a few malfunctions or cosmetic issues, and can generally be purchased under $2,500. Then you have a scale of beater cars. Some are in some seriously bad shape (mechanically, aesthetically, or both) while others can be in amazing mechanical or aesthetic condition (usually not both). The cost of a beater can vary, however, from the $500 to $2,500 range. The lower the cost, the more problems and higher likelihood of it dying sooner, rather than later. At the higher end, slightly above $2,000, you can actually get a car that could last you many years if it’s treated right. It’s also important to keep in mind that a “beater car” doesn’t necessarily mean a bad, unreliable, breaking down car. Sure – beaters more often than not fit that description, but they don’t have to. In fact, my “beaters” have always worked wonderfully! It just depends on the car (and the person driving said car). These are not exclusive, it could certainly be for a first car and to reach financial goals. But if you want to reach financial goals and have other factors that don’t allow for a beater car, then a beater might not be the best financial strategy to help you reach those goals. 100% reliability is a must (whether that’s for work or frequent hospital visits, where an unreliable car could actually be life threatening). You make money from your car and need a specific model (e.g Uber requires a certain year of car. An old beater than doesn’t meet their requirements would make you unable to make money with them). Looks matter to you. I get it, if you’re one who wants a shiny object, run from beaters because they are far from it. Fixing cars isn’t your forte (or you’re not willing to try). This isn’t a huge issue, just expect to pay more money than your car may be worth if you aren’t willing to do fixes yourself. Basically, you’ll just want to make sure you consider your individual life. Generally, I think it’s a fantastic way to save money and reach financial goals. In fact, driving a beater is one of the biggest ways I’ve personally been able to keep my living costs down and save a decent amount of money in a short period of time. It’s cheap to buy outright. The most obvious benefit of a beater car is that they are cheap, usually below $2,500. This makes it much easier to buy them outright in cash, which helps you avoid any sort of car payments or loans. No car payments. Since you won’t be needing a loan to purchase your beater, you get to skip having a car payment. Instead of paying $200 (or more) per month for your car loan, you can put the money to better use. Whether that’s saving for a vacation, a better car, or investing it for the future. You can get minimum insurance coverage. If you buy a car worth $5,000+, or get a loan on a car, you’ll likely want (or be required to) get full coverage car insurance. This can sometimes double or even triple your car insurance bill compared to minimum coverage a beater could get by with, and that can add up. Over the span of a year, you’ll save $1,000’s with a beater that only needs the bare minimum required insurance. Less depreciation. Buying a car that’s 10 years (or older) has gone through the worst of the depreciation curve, which saves you from facing that loss from depreciation. This is a huge plus because you can easily sell your car in a few years for a minimal loss, which helps pay for the next car. Keep reading to hear about my story of how I did this, and only spent $250 for a car I used for 2 years (and put 30,000+ miles on)! Cheaper gas (usually). Newer cars more frequently require premium gas, and that can cost you every time you visit the pump. In my experience, older cars usually take the cheapest gas, saving money every time you go to the pump. Over a year, this can save you $100’s (if not $1000’s). Cheaper parts. Finding parts for very old car is hard, but we don’t want cars from the 70’s or 80’s. We want a car right in the sweet spot of the 90’s and early 2000’s. These car parts are still very easy to find, and in fact more abundant compared to newer cars in junk yards. You can find parts for pennies on the dollar in junk yards, and you’re much more likely to find your car at one if it’s older compared to newer cars. Lower car taxes. If you live in a state that requires you to pay car tax, going with a good beater car in which it’s value is low, you can reduce your tax bill with a low valued car compared to a car worth more. Freedom. Okay, this is a bit of a stretch – but think of how free you are with a beater. You can back into a wall, get hit by car doors in the parking lots (or those dreaded shopping carts), and not really care that much. If it gets a little scratch, or even gets totaled, it’s not nearly as painful as it is with a more expensive car. Okay, okay – beater cars aren’t all rainbow and sunshine. Yes, the biggest benefit is saving money – but there are some downsides to beaters. Potentially less safe. Modern cars these days have fancy safety systems, accident avoidance systems, and even autopilot. Not just that, but beater cars, being that they are older, are more prone to break – including safety systems (like my friend who’s e-brake doesn’t work, yikes!). It’s important to keep this in mind, especially if you have kids. Generally, making sure it’s safe to drive by an authorized mechanic should ease your mind (which I highly recommend anyways). Higher lemon likelihood. With the unavoidable fact that older cars are more likely to break, your lemon likelihood as I like to call it is significantly higher than buying new (or newer used). The engine, transmission, or something else could blow – and you’d be better off getting an entirely new beater at that point. Plus, you won’t be getting any sort of warranties like you might with a new or even used car from a lot. But again – it’s the risk you take. To mitigate this risk, be sure to read the section on “how to buy a beater car” below! Long distance car rides might not be possible. Driving a beater long distance can be fine, but can also be disastrous. It all depends on the car. If it’s a true $500 beater, you probably won’t make it. If you do lots of road trips and long distance driving, consider at a minimum getting a good beater – because long drives can be harsh on old beaters, and you certainly don’t want to break down 2,000 miles away from home! Not all beaters are created equal. If you can, you want to be a little picky when buying a beater car. From what I’ve seen, beater cars are a dime-a-dozen, and there is no lack in supply of them. For this reason, you should take your time when buying one and see as many as you can. Think about it like this: the more you see, the more likelihood you have of finding a gem (as in, a great beater car). How many miles does it have? A popular question you might have yourself is, how miles is considered “bad?” Unfortunately, it’s so black and white. A car treated badly and not maintained properly could give out at 150,000 miles while a car treated properly could last 200,000 miles (or more). That means the most important thing is how well the car was maintained, and you’ll need to get that info from the owner by asking for proof of maintenance records, and just getting a general vibe for the person. Also – a car with many previous owners is usually a bad thing, because it increases the odds the car was not maintained properly at one point or another. With that in mind, a car nearing 200,000+ miles is a lot, and as a rule of thumb, you shouldn’t expect that car to last much more than about 50,000 miles more. Has it been maintained? Expanding on the previous consideration, you’ll want to know what types of maintenance it’s had. When was the timing belt replaced? Oil? Gas filter? Transmission fluid? More importantly, has all of this been changed in coordination with the recommendations found in the cars handbook. Remember: a poorly maintained car is going to be the least reliable. What’s the Kelly Blue Book value? Kelly Blue Book (KBB) is a great tool to use to search for the value of a car. Throw in the details of the potential beater and see what price is comes out with. If the KBB price is lower than their asking price, keep in mind you might pay more than what the car is worth if you don’t negotiate. On the other hand, if the KBB price is significantly higher than their asking price, it may be because they are hiding something (or, you found a great deal). Just keep in mind the KBB while negotiating, and be suspicious of overly cheap asking prices – it can be a bad sign. What’s my goal with getting a beater? Is the goal to save the most money possible? Just need a winter beater car? Do you want the car for 1 years? Or 10? Get very clear with your goals, this way you won’t end up buying a car that won’t align with those goals and cause you more issues than you signed up for. Ask friends and family. You’re bound to find what I call a “beater car expert” that can lead you in the right direction. Look at the J.D Power Car Awards for the cars year (goes back as far 1999). For example, here is the 2005 edition which reports the most reliable car brands that year. Search online for discussions on the car. You’ll find many forums and threads discussing virtually any car you can think of, and you’ll get a good idea of what you’re getting yourself into. What should you test before buying? Testing out a car is a step you can’t skip on, you really can’t. To do it properly, you don’t need to be a car expert (or even bring one along). A good checklist (like this one from ChrisFix) can guide you in testing a car entirely before purchasing it. Even though you’re buying a beater, and things will be wrong with it, it’s important to know what you’re getting. For example, you certainly don’t want a car that will die an hour after buying it. Testing it can help prevent getting a beater that will require expensive repairs or be a complete lemon. The years are give or take, but generally you will find good beater cars that are worthwhile pre-2005 and post-1990. Beater cars are inevitably going to need to be fixed, whether it’s something as simple as a headlight or more complex like a spark plug or sensor, you’re probably looking to save money on repairing your beater. So, how can we save money while fixing our beater? The #1 way is by doing the repairs yourself. Things like sensors, headlights, and even radiators can be fairly easy to replace yourself – even if you are not a car expert. Simple searches online can usually find repair videos and articles making it easy to follow along. Will you be able to replace an engine yourself? Probably not. But that’s not what usually goes. It’s the breaks, sensors, and little things that keep the car running that will go the most. And if you aren’t doing them yourself, you can rack up a bill quickly. For example, I switched out both O2 sensors myself on my previous car for just $50, which was the cost of the sensors. This would have easily cost me $200+ dollars at a dealer, and it was a fairly easy fix. Just be willing to fix these things, that’s it. Buy the parts online, pull up a video, and go at it! I’m nothing close to a car expert (seriously, far from it), and so if I can do it, so can you. Get a steering wheel cover. Beaters usually have an awfully worn steering wheel, and a cover can improve the looks of your car by itself. Replace the floor mats. If you even have floor mats, get some new ones. It’ll help to interior’s appeal a decent amount too. Get rid of the smell. If someone had dogs or smoked in the car previously, it probably doesn’t smell the best. Get that out with a deep clean, or at least cover it up with some air fresheners. Clean it! Inside and out, give the car a good cleaning. It can do wonders to clean up crumbs and get rid of the built up dirt on the handles, steering wheel, and anywhere else you put your hands every time you use the car. Replace the headlights. Getting brand new headlights to replace the old, probably foggy, headlights can make a HUGE difference on a beater. It might cost you $100 or so, but it can really help the physical appeal of your beater. Word of advice: Treat your car kindly! Even if it is a beater. Treating your car right and simply doing the maintenance on time can go a long way when it comes to the longevity of your car. Treat it right, and it’ll last longer (and incur less costly fixes). When a beater car breaks down, it’s a hard decision to make on whether to fix it or junk it and get a new one. Let’s assume you’re beater is worth $1,500, that seems like the middle price of most beaters. It’ll cost $300 to fix my $1,500 car – worth it? I’d say yes! It’ll cost $50 to fix my $1,500 car – worth it? Uh, yes! It’ll cost $1,500 to fix my $1,500 car – worth it? Well, maybe. What else is wrong with my car, and more importantly, what are the odds of something else expensive going wrong soon? If something else expensive is going to “go” soon on your beater, spending $1,500 (or any significant amount of money) to fix it is an obvious no-no. But, if you know your car and everything else is in great order, then it might be worth it. Think about it, would you rather spend $1,500 and know exactly what you have? Or, sell it off at a significant loss, and buy something else and not know exactly what you have? It’s a hard one to navigate, but knowing your car and the entire condition it’s in is crucial to make that sort of decision – which is hands down the hardest decision to make regarding beaters. Where to sell a beater? You’ve got a few options when it comes to selling a beater, some of which will not be an option depending on the condition of your car. Sell it to someone who fixes cars. Posting your car online with the issues it has will attract these sorts of people, and you can yield a little bit more money than some of the other options on this list. Sell it to another beater car driver. If the beater is still a beater, and not broken down entirely, you can sell it to someone else! This is the best option to go with, especially if the car is drivable and other beater car buyers would buy it. Donate it. You won’t get any money donating your beater, but you could get a hefty tax deduction. You’ll need to itemize on your taxes to be able to do this, so if you do, it might be a good option. Sell it to a junk or scrap yard. Car junk yards will gladly take your broken down beater, so will metal scrap yards. Call a few up and see who will give you the best price. I’ll be honest, I’ve never owned a “true” beater. I always utilize the tip outlined below when buying a car, buying right above the definition of a beater. This has allowed me to seriously save money, in fact, it allowed me to have a car for 2-years, put 30,000 miles on it, and only sell it for a $250 loss. 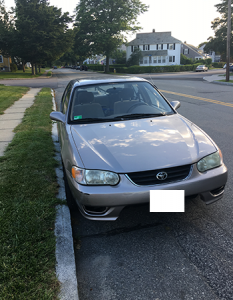 Basically, my first car ever was a 2001 Toyota Corolla (picture). I bought this for $2,000 with just 105,000 miles on it. Over two years, I put a solid 30,000 miles on it. Then I sold it for Just a $250 loss at $1,750. This means I spent just $125 per year for my car. Obviously I spent money on gas, oil, and a few fixes, but nothing that wouldn’t happen with any other car. For what some people pay per month for their car, not including gas and other costs, I paid over the span of two years. It wasn’t just luck either – I’m on track to the same situation with my latest car too – a 2004 Honda Civic – assuming it holds together (which it seems it will). Buy slightly above the beater car definition. This is what I’ve done for all my cars, and it’s saved me the most money. You don’t have to settle for a $1,000 car that will break in a year. Instead, investing just $2,000 to $3,000 in a car can end up with you having that car for 5, 10, or more years. Sure, $2,000 to $3,000 won’t get you a beauty, but it won’t get you an entire train wreck either. I’ve bought two cars in this range, both of which did not have any rot or any mechanical issues, besides very minor things. So, if you can, consider buying slightly above the definition of a beater, especially if the goal is to save money. You’ll end up with a car that gives you far less headaches, potentially lasts for another 10 years (or more), all while providing a safe and reliable way to transport. Beater cars, they are truly amazing in my financially focused eyes. You can save money, and still get around on your own. Are they for everyone? No, not entirely. But, if they are for you, I wish you luck – beaters aren’t always pretty, but the benefits can seriously outweigh the downsides. I hope this guide has been helpful, and will lead you into better finances. I’d love to hear what kind of beater you have, or why you choose not to get one (and what you went with instead)!